Slack today introduced products aimed at easing the process of building apps on its platform, catering to the developer crowd that has long favored its team chat app and, ultimately, looking to boost the overall user experience. Specifically, it announced availability of Block Kit, a UI framework, and Block Kit Builder, a prototyping tool. The Block Kit UI framework provides developers with new ways of displaying dense information as well as more control over app message interactivity, Slack said in a blog post. Block Kit comprises stackable message components, or “blocks,” that enable developers to prioritize the order of information more easily than they were previously able to do. 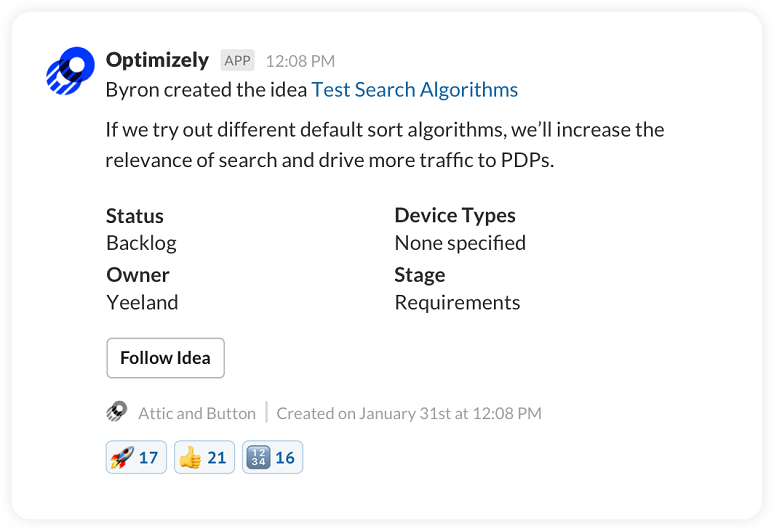 Digital marketing platform Optimizely is one Slack customer that has been using Block Kit in beta. Product and marketing teams use Slack to test and track digital campaigns. As the graphic below shows, the context block helps Optimizely users understand that the Slack notification is referencing the “Attic and Button” marketing campaign. The Block Kit Builder prototyping tool allows developers to test app interactions as they would appear in Slack. The ability to select blocks, edit code, and view the payload should help them more easily understand and use the code (shown below), Slack said. Block Kit Builder includes customizable templates based off pre-built common use cases for Slack apps, such as approvals, notifications, polls, and search results -- “so you not only have a foundational example of how to use blocks, but a head start with the majority of the code populated for you,” Slack wrote in its blog. For an app that shares updates between your enterprise’s CRM system and Slack, for example, developers would choose the “Notifications” template. 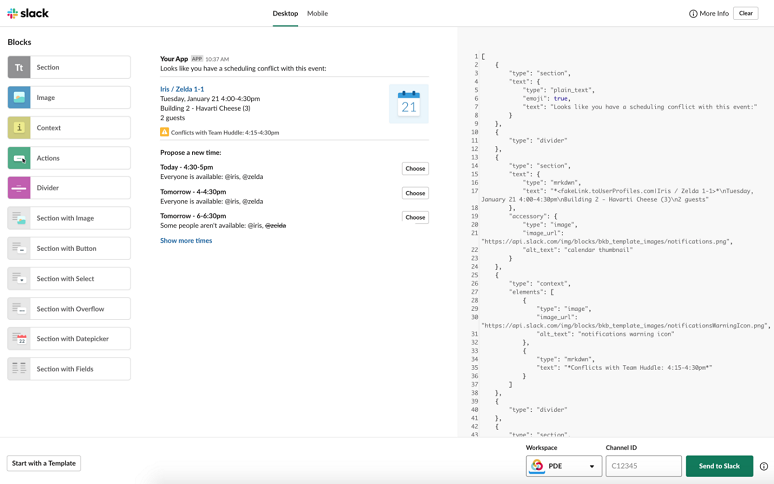 They’ll see a pre-built notification message in Block Kit Builder with the corresponding JSON code; developers can edit and add or delete blocks as they see fit and once done, can copy and paste the JSON into their app’s code. Slack claims to have more than 10 million daily active users of its team chat app, and 94% of its paid teams actively use apps on the Slack platform. Ultimately, easing development tasks should result in a better user experience with the platform – and it highlights a trend that has more enterprises working to empower their developers to solve their business problems. Find Slack at booth 819 on the exhibit floor, Enterprise Connect, taking place the week of March 18 in Orlando, Fla., and take a deeper dive into the developer mandate in the Monday morning mainstage session, “Empowering Your Organization for a Developer-Focused Future.” If you haven’t signed up for Enterprise Connect yet, register now to take advantage of our Early Bird Rate, which ends next Friday, Feb. 22. Use the code NJPOSTS at checkout to save an extra $200!